PULSONIC has developed a wind system, called ALIZIA 312, initially for Météo-France to provide high quality wind measurement in speed and direction. The ALIZIA 312 is fully autonomous with it's own solar panel and CPU unit to do the calculation such as Min, Max, Average (2 min, 10 min). The ALIZIA 312 is compatible with the PULSONIC automatic weather station, Pulsia. To meet the recommendations of the WMO, ALIZIA 312 can be installed on a ten meters mast . 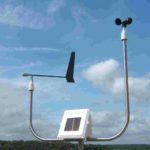 Thanks to PULSONICs Low Power Technology, this wind sensor is powered entirely by solar energy integrated to the system. ALIZIA 312 is made of robust material (stainless-steel, cast aluminium housing, carbon fiber, polyamid). The robust conception allows the system to work perfectly even in highly demanding climate. The anemometer and the wind vane use high quality bearing wheels to keep high quality measurement and minimize the maintenance.